Since it is summer and you might be starting to get desperate for something to do with your kids that doesn’t involve electronics or spending a bunch of money, I thought it might be fun to put together a list of our ten favorite tried-and-tested, kid AND parent approved games. None of them require reading, which makes them appropriate for ages 3 or 4 and up. Our kids are 4 and 6 and now that we have played them all together a number of times, they are also able to play most of them by themselves as well. 1. 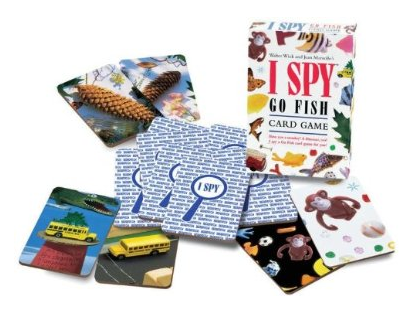 I-Spy Go Fish-Of all the family games we play, I can honestly say that Go-Fish is probably still our overall favorite. We have the I-Spy version, but I think any set of Go-Fish cards would be equally fun. For Trouble, learning how to hold her cards and not tell everyone what was in her hand has been a big achievement in the past year, one that gave us no shortage of laughs along the way. This simple pairing game is a classic for a reason. It is also a great one to take along on trips! Kid Score: A+ Parent Score: A- Independent Play? Yes, but requires 3 or more players. 2. Spot It-We absolutely LOVE Spot It! This game is proof that good things come in small packages, and this is another one that is easy to pack along on trips. The concept is super simple, but it is fun–and challenging–for all ages. Each of the round cards has a set of shapes and icons, but on each card only ONE icon matches an icon or shape on another card. The challenge is to find which icon matches on your card and the center card before someone else does. There are several variations on the game, all of which are fun and easy to learn. This is a great game for helping kids build observation and attention skills! There are now several other versions of the game, supposedly for younger kids, which look fun as well. Our girls have been fine with the “regular” version. 3. Hisss-This simple game of making snakes by matching the right colors is my four-year-old daughters absolute favorite. She could play it all day long. The object is simple–take turns drawing cards & matching the snake segments (either a body, tail, or head) by color. If you “complete” a snake so that it has a head, a tail, and at least one body piece, that snake is yours. The player with the most snakes wins. We have found that the kids enjoy playing this game long after the adults have gotten sick of it! 4. 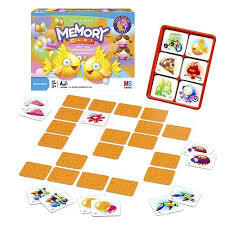 Original Memory-At one point we had 3 or 4 different versions of the Memory game, but ultimately we decided to keep just the classic original version, which is filled with basic pictures like clothing, animals, & food items. For anyone who’s never played, the concept couldn’t be simpler–just lay out all the cards face down and take turns flipping over two at a time trying to find a match. We have found this game to be particularly good for building concentration and attention skills! Kid Score: A- Parent Score: B+ Independent Play? Yes but need help with set-up. 5. 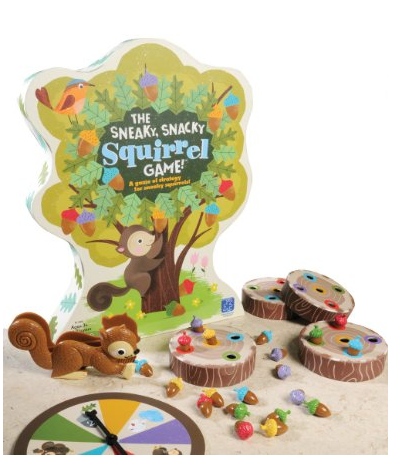 Sneaky Snacky Squirrel Game-A slightly more fun & engaging version of the classic Hi Ho Cheerio game, this game involves gathering five different colored acorns to fill your stump. Players take turns spinning the wheel to see whether they will get to choose an acorn, get to steal from another player, or lose all their acorns to a windstorm. My kids especially like picking their acorns with the little squirrel-shaped tongs. 6. 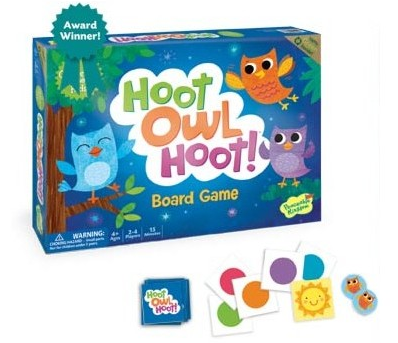 Hoot Owl Hoot-The object of this cooperative game is not to win on your own, but to work with the other players to get all the owls around the board and to the nest before the sun comes up. Players learn to use strategy to “set up” an ideal situation for the next player to make a big move. The overall concept is simple, but the strategy aspect makes it very challenging. This is one game that the adults enjoy as much–if not more–than the kids! 7. 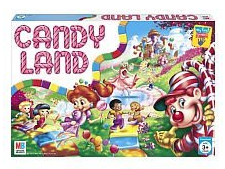 Candyland-Who doesn’t love Candyland? This absolute classic has been a family favorite for many years now. Players pick a card and move to the colored space, sometimes getting lucky by moving ahead to a special character spot, and sometimes having to move all the way back. I think of all the games we play, this one has been the best for teaching our girls how to be gracious winners and losers, and to deal with the disappointment of setbacks. 8. 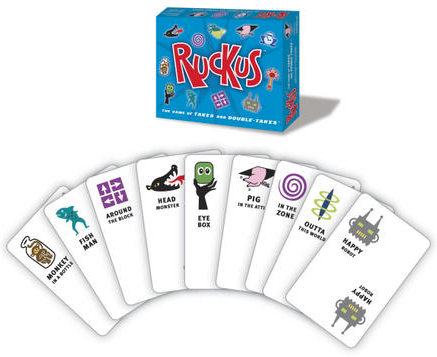 Ruckus-This fast-paced game is all about creating sets, then stealing them from other players (and stealing them back.) A little confusing at first, but ultimate fun, exciting, and challenging, this one is definitely one that we are still growing into. The girls like to play but aren’t quite old enough to do it on their own. 9. Tell Me a Story-This “game” is a set of cards with different pictures on it. 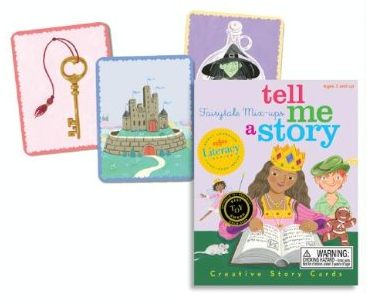 (Ours is the fairytale mix-up set, but there are several other sets as well.) Players shuffle the cards then start by saying “Once Upon A Time….” They take turns drawing a card and adding to the story. Our girls absolutely love this game and it will entertain them together for hours at a time. It is hilarious to hear the stories that they come up with on their own, and it has been really good for their narrative skills. If you homeschool, it is an awesome language arts activity! 10. 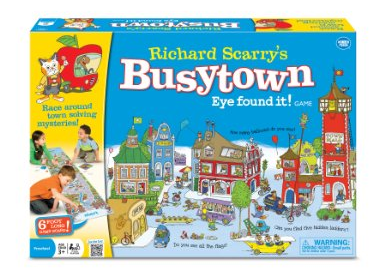 Busytown Eye Found It Game-Another fun collaborative game, this one has players trying to reach the picnic blanket finish line before the pigs eat all the food. Players must work together to solve “mysteries” and to find objects hidden on the board. It is fun, original, and very engaging for all ages. The only drawback is that the board is BIG and cumbersome which for us usually means playing on the floor. I’m sure I missed more than a few good ones. What are your family’s favorite board games? Thanks for this great list! I can’t wait to check some of these out. My kids love games too and we are always looking for new ones. We love Spot It! We also really like Qwirkle and Rummikub. Oh, and UNO! You’re welcome Angie! We like Qwirkle too but the little one is not quite into it yet so it didn’t quite make the list. Can you believe we don’t have UNO? Need to get that one! Thank you for the list, I’ve been wanting to find some new games that both my 3 and 5 year old would enjoy and be able to play. Zingo is a good game for that age group also. Some of these look really fun. My kids are already bored with summer. Hopefully this will help…. Let me know which ones you like the best! We still play “Uncle Wiggly” and “Chutes and Ladders’. A new one is “Left, Right, Center”… it’s another small game that comes in a 4-inch tube. For cards I would add Crazy Eights and Old Maid. Some other great games are: Feed the Woozle, Zingo, Sequence and Monopoly. My boys love Zingo, too! Roll and Play is also a fun one for really little ones. Our kids are a little older (6-12 for the ones at home), but we love the game Headbandz. You pick a card from a stack, and without looking put it on your headband. Then you have to try and guess what you picked by asking questions. Both the kids & grownups like this one! Other games we play often are Uno, Clue (the card game), and Monopoly. We just got Headbandz too and my 4 year old loves it! It’s quite a good learning game for her, she needs some hints sometimes, but it’s fun to watch her think of questions to ask! Entertaining for all ages! We have loved Hiss for years. Great for 4 year olds and up- fast paced but allows younger players a sense of accomplishment because you collect snakes as you go. So even if your little one does not have the most cards to win, they have a chance collect something as you play. Thanks for sharing your favorites. We just receieved The Sneaky Sancky Squirrel Game as a gift. We like Crazy Faces which is similiar to Crazy 8s with produce pictures. I keep it in my purse so we can play at restaurants. We like Skipbo, Sorry, and Yatzee. Thank you for the wonderful reviews! Our children have started to enjoy playing games this year and we would love to add some new ones to our collection. Our boys love Thomas Uno and Dino Dig Monopoly (both specifically designed for this age group) and our 7 year old really enjoys playing Battleship. Another Spot It fan here. We’ve given it many times as gifts because it’s so much fun. We also like Spuzzle. My daughter got it when she was 4 and it’s not painful for the adults. You each are making 4 piece puzzles of different animals based on cards you turn over, but can force players to take a piece off uncompleted ones, or draw a wild card to choose your piece. Many on this list are new to me. I will have to check them out! I’m so excited to try some of these games!! Thank you so much for sharing them! Also, I would be interested in guest posting if you still have availability. Please let me know what kind of post you would like, and I will do it. Thank you for your blog. It’s always so much fun!! Great collection of board games. It is really great that these type of toys are available today which stimulates the educational skills of our kids while keeping them occupied and happy. 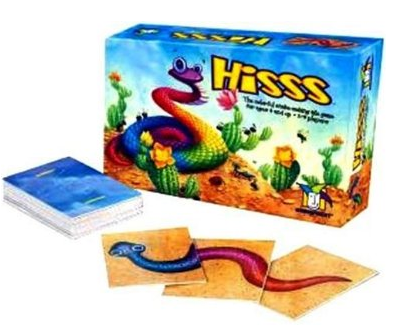 Based on your recommendations, I purchased Hiss, Spot it and Tell Me A Story. I have a 2 and 5 year old and we love playing games. A few that I loved growing up and that my kids aren’t quite ready for are Mastermind, Payday, Stratego, Othello. Starting to play a few of those with my 5 year old but usually have to modify a bit. Games are SO good for them! A SUPER fun learning game for elementary aged kids through adults is called 24. Just search for “24game.com” and you’ll find the game. I love playing the version that has add, subtract, multiply and divide to get to 24. I taught 5th grade and my students loved this game. My husband and I even like playing it together. It’s a nice quiet game and builds math skills at the same time. Our new favorite is Sequence for Kids! My boys are 2.5 and 4.5 and they love it. My husband and I love the original Sequence so this kid version is perfect for our family. No independent play yet but perfect for family game nights. The Sneaky Snacky Squirrel one is pretty simple, and our kids started playing Candyland at 2. It really depends on the child at that age! May I just say what a relief to uncover somebody that actually understands what they are discussing on the internet. My Kids love Spot it as well. The new favorite lately is Don’t Break the Ice. Great list! We love Spot It as well and I have read several good reviews for the Squirrel game – going to have to try. Your little one may still be too young, but around age 5 is a great time to start playing Blokus. That is a great family game that was recommended to me and now we love it! It’s even a lot of fun for the adults. You have to play with at least 2 players – it is a strategy game. Definitely don’t play with really little kids though because there are small pieces. Hi! Just stumbled across your blog via Pinterest. My kids are 2.5, 5, 7 and 9, 1 boy, 3 girls. We love Monopoly Deal. It’s a twist on the classic game played with a deck of cards. It’s much faster and requires a little more strategy and sneakiness. We love it and play it for hours when we’re camping. Our five year old can’t read yet but for the most part has the cards memorized so can play with a little bit of assistance. It’s a game that we really all enjoy and me and my hubby will even play by ourselves. The other game, probably just for adults is called Rage. It’s a card game too, requires some strategy and can change on a dime. It can be super fun and frustrating at the same time. My kids also love Sorry and when yours get a little bigger, Beat the Parents. Have fun! My nephews, 4 and 9, love playing UNO and Guess Who. We have to help the 4 year old a bit but he can do a lot on his own. I’m a reading teacher and Guess Who is also excellent at letting them use inference and conclusions, which is a tough skill to learn. Great list! 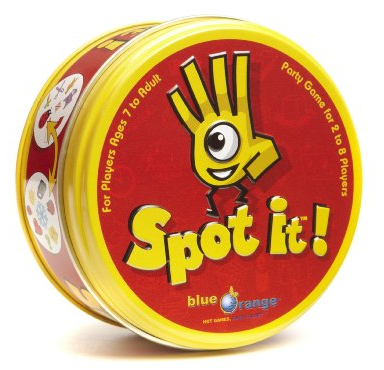 I’m going to buy Spot It for my niece and play with her. Rat-a-tat Cat is our favorite. It’s a card game that is quick to play, we enjoy it as much as the kids. It is also great for adding single digit numbers and learning value. 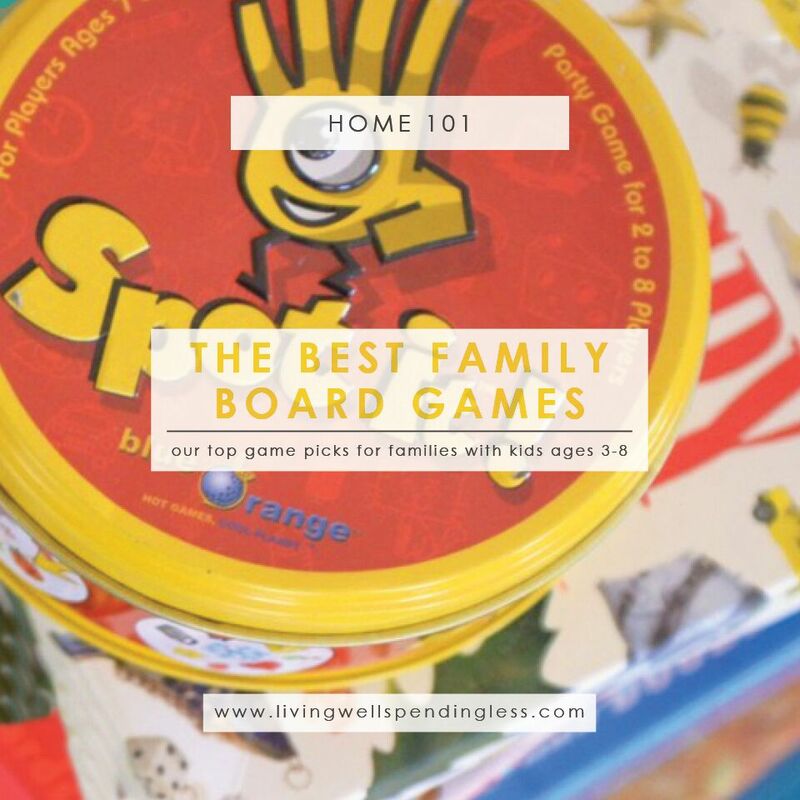 Play family board games are a great way for families to Spend quality time together. We love playing Sequence for Kids at our house! I read this looking for games to play with my grandkids. Got reminded of some old favorites and intrigued by some new names. Can’t wait to get them and play!! Thank you! Once your kids can read, Munchkin is a great card game (not recommended for those with religious sensibilities against magic, faeries, monsters, etc.) There are umpteen versions (some are less kid friendly than others)…stick to the original and avoid expansion packs until the kids are about 10. Basically you create a ‘story’ where your ‘team/group/party’ is going through a dungeon/lair room by room, fighting monsters and taking treasure. But ultimately there can only be one winner, so there’s negotiating and trading and no small amount of sneaky back-stabbing involved depending on the maturity levels of those playing. Requires at least 3 players though you “can” do it with 2 if you pull out the higher level monsters. Only works for self-entertainment with readers. Great list of family board games. Best thing I liked about this list of games is that child can play these games by themselves without much reading. Recently I purchased cloud hopper https://logicroots.com/math-games/cloud-hoppers/ as a birthday gift for my nephew on his 6th birthday. It is also very fun, easy to understand simple addition and subtraction game. He is really enjoying this game and we play this game every weekend. Trouble & Hi-ho Cherry ‘O are good counting games. I really enjoy this other game https://logicroots.com/math-games/ocean-raiders/ from LogicRoots. My nephew loves this a lot. What wonderful toys!! I love your list. Thank you for sharing .very good publish, i actually love this website, carry on it. My 4 year old currently likes Disney Codenames which since it’s played in teams can be played with the youngest to oldest gamers while still being so much fun for everyone. My kids also like Hoot Owl Hoot and Spot It. Mom likes them too!